When I’m doing just an easy hour long run, I try to run some hills instead of completely flat paths, easy for me to do since I live in a shoe on a hill. 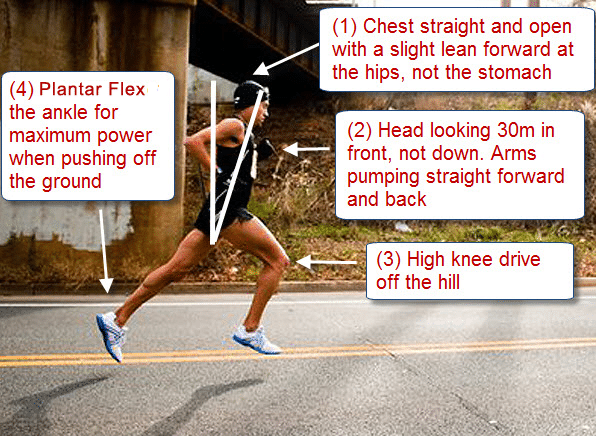 Running hills can make you a stronger runner and will help you mentally and physically prepare for them in a race. It’s important to lean into the hill but keep your chest open, don’t hunch over. Focus on keeping the same effort, not pace. The problem with running hills is that it’s harder work and your pace slows down. In other new, life is unfair. Concentrate on keeping the same effort because your pace will slow down (you can make it up on the downhill) and this way, you can reach the top of the hill and not be completely and totally gassed. I don’t look at my watch at all when running hills because all that happens is I feel like I’ve been running a mountain for a solid mile or two, and I look down and see it’s .15 miles and I’m averaging a 2 minute slower pace. fun. So instead I look about 10 feet in front of me and concentrate on getting to the top. I’ve also heard to visualize a rope tied around your waist pulling you up the hill. 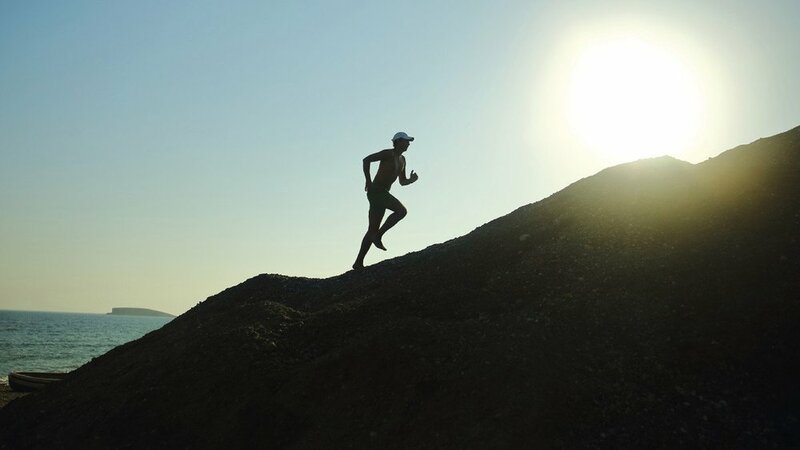 Runner’s World has an article on hill workouts and other tips. I will still be blogging (got some great posts and guest posts lined up), but I might not be as quick responding to email so check out the Advice page first for answers to common questions and “how to” posts. On Saturday I’m running the Rock ‘n’ Roll Seattle Marathon with PRO Compression. Better get the USA 4th of July socks now, there’s only a few sizes and pairs left! The code JL4 saves you 40% and free shipping. I’m be sporting mine on the boat like a boss. I hope to catch a glimpse of you at the race…I’ll be checking out the socks for sure….I love mine and perhaps need a new color for Saturday! My parents went to Alaska before my twin and I were born … you will have so much fun! Have a great trip! You should run the Soda Screamer! I run it every year (my sister in law lives there) and it is so fun. The whole town comes out in costumes to cheer you on. Total small town race. For me, the best way to run up a hill is to shorten my stride, but quicken leg turnover. Then, you’re not putting as much strain on yourself and you get up the hill faster than you’d think. I totally did some hill training yesterday. I felt quite triumphant and can’t wait to do it again. Thanks for the hill tips! I’m running my first half marathon at the RNR Seattle this weekend too! My friend ran the Savannah Rock N Roll Half Marathon this year and loved it! Exciting! Can’t wait to hear about it! Ditto to what Morgan said! I ran a good portion of the Big Wild Life Runs half marathon last August on the Tony Knowles coastal trail and it was beautiful! I know I’m a weirdo but I love hills! I do hill repeats at least once per week and I noticed that my overall pace has improved a lot since I started training on them more and more often! Thanks for the hill tips! I always get discouraged running up hills when I slow down a lot. I will have to take your advice and just focus on my effort! Safe travels to you. I actually really like hills. My pace is much slower (obvi) but I always feel super strong and exhausted after aka killer workout. Have fun on your trip. Catch lots of fish! I don’t really like running hills, but this is mostly because I never get the change to train hills. It’s pretty flat here, and when I run hills, it’s during races. I am definetly feeling that I don’t train hills during those. Have a great trip! Hills are evil! I still can’t stop myself from taking a prompt detour as soon as I see one coming up. Oh well, better only run downhill races from now on – there are loads of those… right? I tried really hard not to want the 4th of July Pro Compression socks because I really don’t need them but I caved. They’re just way too cute. Have such a great time in Oregon and in Alaska! Those are two places on my traveling bucket list. They both looks gorgeous! that picture of the mountain is how i feel running hills. sometimes i close my eyes and pretend that i am still running flat surfaces. I’m a new runner and I love that you started this post off with “When I’m doing just an easy hour long run, I try to run some hills…”! I hope you know how inspiring it is to know that I might someday be able to make a statement like this. Other than that, I live in an area where I can’t involve hills. I did 2-miles yesterday and tried to do a “flat” course but still ended up doing 154 ft. elevation. But I’m hoping this will make things easier on me when I start doing races.